Shellie Zimmerman continues down the Trayvonite path by going on none other than NBC’s Today show, the very entity that is infamous for playing its part to establish the false narrative and false character of her husband as a “racist”. Choosing such an entity is a statement unto itself and tells me she knows exactly what she is doing. In my opinion what Shellie is doing is playing a dangerous game. She wants to hurt George and the way she believes she can accomplish that is by posturing herself as a threat to him. The threat being that she, at the very least, will make herself readily available to two specific entities with a high interest in what has transpired over the past month or so with Shellie and what she has said, i.e. The Estate of Trayvon Martin and the U.S. Department of Justice. Of course as we know NBC also has an interest as well as the only entity so far sued from the other side. Keep in mind this is merely a posture. Shellie hasn’t gone full Trayvonite just yet. This was reflected in her statements on the Today show when she called into question the innocence of George in the death of Trayvon yet she was steadfast in her denial of the racial aspect. Apparently disparaging your husband as a murderer is more acceptable than doing so as a “racist”, typical white guilt and fear of appearing racist. I suspect she may change that position over time as certain incentives from certain entities may entice her to do so and/or her scornful selfish ego continues to seek vengeance against George. All is not completely lost though. Even if Shellie does go full Trayvonite, though I believe enough damage has already been done, the Zimmerman camp holds a pretty powerful card in that Shellie is a self admitted perjurer which will no doubt come into play if Shellie testifies for the other side. Does George Zimmerman Have an Obligation to Expose the Scheme Team(s)? “This latest report however gives at least a glimmer of hope that it will shut Shellie down.” the D-Man predicted yesterday and so it is done, lol, sweet. 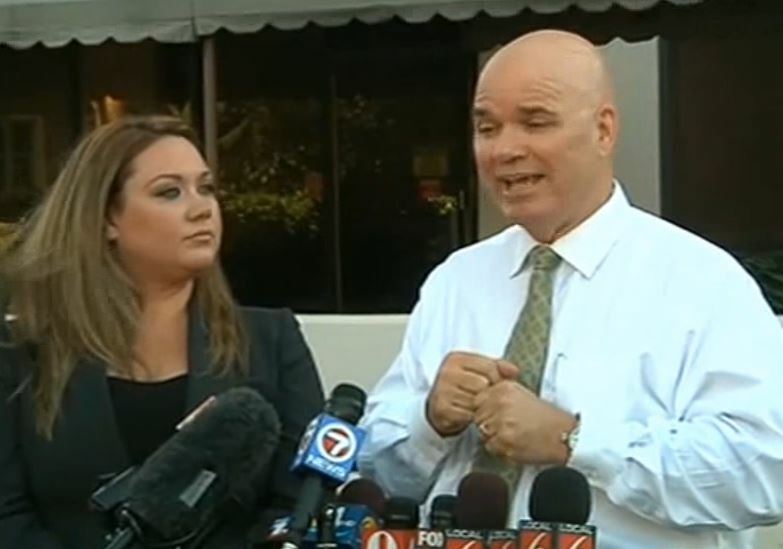 Shellie has hid behind her lawyer who says Shellie won’t be talking to the press and wants this all to go away. I guess she should have thought about that before chumming up with Trayvonite Christi O’Connor and turning traitor. Though the damage done and god only knows what else she’ll do I consider this a victory. If anyone uploads the presser I’ll post it here later. It wasn’t nothing great, just a bunch of apologetic spin mixed with an awkward sense of humor. I could care less for all the Days of Our Lives drama regarding Shellie’s and George’s personal lives. I don’t care about the why of what is motivating Shellie to do what she has been doing or what she may think she will gain. What I do care about, what I’ve cared about all along, was how it is we all got here in the first place, what can be done about it and what can be done to prevent it in the future. It’s clear that Shellie Zimmerman does not feel the same way and has in effect destroyed any chance of holding any one of the schemers accountable. In fact she is doing just the opposite and helping to embolden the schemers and shore up a future civil suit against George by what appears to be merely out of spite. Again, for whatever he said/she said reasons, personal life crap, “going through a divorce”, “PTSD” or whatever else you want to wrap around it all matters not in this regard. I’ve pretty much abandoned all hope, since writing Does George Zimmerman Have an Obligation to Expose the Scheme Team(s)?, that any one of them would be held accountable because unfortunately after writing that post that was also the day Shellie began whatever it is she is doing and that same day I realized where this was going and sure enough here we are. This latest report however gives at least a glimmer of hope that it will shut Shellie down. Just the mere mention of the fact that the prosecutor will look in the direction of Shellie potentially making false statements should be enough to have that effect whether or not what Shellie said happened was real or perceived. However, though this may mean no further damage can be done, in regards to the larger aspect I believe enough damage has already been done, the schemers truly have nothing to fear now. I find this unfortunate especially in light of my recent post which tells me they are not willing to fight, then again I’m not the one being tried so it is what it is I guess. It’s a question I’ve wrestled with for a long time now. Of all the victims of the Scheme Team’s actions, George is in the absolute optimum position to expose the perpetrators to their fullest and bring as much justice as there can be. However, George has also been through some of the most trying experiences very few can say they have had the pleasure of experiencing and as such an aversion to face it all again, albeit on the opposite side, is completely understandable. But at the same time to even begin to contemplate the damage done by the Scheme Team(s) and to sit back and do nothing about it seems just plain wrong to me especially when you are the one best suited to end it. I am not a lawyer but it occurred to me recently that a possible solution would be a class action lawsuit against the Scheme Team; Sybrina Fulton, Tracy Martin, Benjamin Crump, Natalie Jackson and Ryan Julison brought by George Zimmerman and many others to include George Zimmerman’s family members, Bill Lee, Norm Wolfinger, Christopher Serino and other random victims of violence who if not for the actions of the Scheme Team would either be living today or never harmed. This would alleviate George from being the sole litigant yet by his inclusion bring to the table so much of what was gathered and established through the criminal case against him. The Scheme Team; Sybrina Fulton, Tracy Martin, Benjamin Crump, Natalie Jackson and Ryan Julison acted as a single entity when they conspired to go after the Sanford Police Department and George Zimmerman so I would think they ought to be tried as one entity. That takes care of the primary or top tier of schemers if you will. The second tier consists of City Manager Norton Bonaparte, Mayor Jeff Triplett, Attorney General Pam Bondi, Governor Rick Scott, State Attorney Angela Corey and Assistant Attorney General for the Civil Rights Division Thomas E. Perez and Deputy Assistant Attorney General Roy L. Austin Jr. I would think they would have to be named in the suit as well however given such heavy political players would no doubt make the task much more daunting than dealing solely with the first tier. Yet it’s critical to have these people as they are as guilty as the first tier. The third tier of schemers I consider and label are the support members. I consider these to be all the black organizations such as the NAACP and NOBEL (The National Organization of Black Law Enforcement Executives), perhaps SPD and FDLE officers conspiring with and giving information to the top tier scheme team or perhaps worse such as witness intimidation and destruction of evidence, and finally the media such as NBC and ABC’s Matt Gutman. This tier is a bit more difficult as we are moving further away from the top tier and roles may have been small for some yet still significant enough to include and again just as responsible. George Zimmerman faced his judge and jury, when will they? For years I have been interested in how society deals with issues of race and gender. Simply speaking for brevity, one of the main things I learned was that society treats these two areas essentially in the same fashion. The two main focuses are blacks and females who are victims and whites and males who are perpetrators. Institutions, laws and organizations for these two groups of victims are set strongly in place with no signs of slowing in growth and support. Considering humans love their fairy tales the concept of the arch enemy is needed and as such we have the perpetrators who are whites and males. And as such any groups for whites from the onset are deemed racist as well as any groups for males are from the onset deemed sexist. And so with any good fairy tale there is well crafted propaganda. Enter the media. When I first heard of the James DiMaggio case my reaction was one of immediate skepticism based merely on how the story was being spun. There are two stereotypical moulds the majority of the media will cast a story in when it involves certain groups. In its simplest form; blacks and females are the victims, whites and males are the perpetrators. The case of George Zimmerman and Trayvon Martin was created, cast in its typical mould of black victimhood, sold and bought very easily by the public. Yet there is a significant difference in the James Dimaggio/Hannah Anderson case. That case was cast into the stereotypical mould of the creepy male predator nearly right from the beginning, crafted and sold as it always has been yet if you take the time to scan the landscape of public reaction you find they are not buying. Why is there disconnect in public reaction? Someone questions this very thing but I will add this question comes off to me as more of a rhetorical guilt trip of conformity as if to say “What’s wrong with all of you? Why can’t you see Hannah as a victim like you did with Trayvon?” And notice the factors of age, gender and race are at play within the question. The Trayvonite’s answer is stunning to me in that if that is true then why could that Trayvonite, along with so many of the others not do the same for the Zimmerman case? Why could they not question the stereotypical story being sold to them with that same critical eye they now give to the DiMaggio case? My initial thoughts at this moment as to why there is a disconnect in the public reaction is mainly two-fold. There has been significant push back and growing negative reaction to feminism. People are just simply not buying the stereotypical victimhood of females being sold. It appears to me there has been some sort of societal shift, a tipping point if you will; I suppose the cliché of the boy who cried wolf may also be a factor. However I think the second significant factor at play here is race. Within that context there is a two-fold factor. One factor is race trumps gender. Another factor is Hannah is white. So if we take Zimmerman/Martin and contrast with DiMaggio/Anderson, Trayvon beats Hannah in victimhood simply because one is black the other white. I believe the Zimmerman case may be the beginning towards a societal shift regarding black victimhood and grievance. Again of course the cliché boy who cried wolf also a factor, the race card worn thin, lays in tatters. Perhaps within the next twenty years or so the next Zimmermanesque story, race case, the media tries to sell will garner the same public reaction of near immediate skepticism as we will no doubt see in the next Hannahesque, gender case. And instead of becoming the mythical institution/religion the Trayvon Martin case has become it will merely be a another flash in the pan of a dying media and a dying legacy of pseudo victimhood.